Tim Payne is one of Wasps' favourite sons but it looks like his time on the international scene has come to an end. 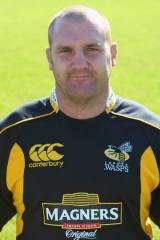 The loose-head joined Wasps in 2003 after having bounced around several clubs, including Bristol and Cardiff, without any major success. But he featured prominently in their 2004 and 2005 Premiership-winning sides and also won the Heineken Cup in 2004. And following that final, he was called up to the England squad for their tour of Australia and won his first cap in their 51-15 loss at Suncorp Stadium. While Payne would continue to develop on the domestic stage, it would be a full two years until he gained his second cap against the same opposition on England's 2006 summer tour. During the 2006-07 season Payne chalked up 26 appearances for Wasps and was rewarded with selection for England's Six Nations campaign in 2007. Payne started England's final two matches of the tournament against France and Wales, but then saw his season cut short in April by injury. Payne damaged his anterior cruciate ligament, ruling him out of Wasps' victory in the Heineken Cup final against Leicester. Payne was also unfortunate as the injury ruled him out of contention for the England World Cup squad, although his performances in the early part of the 2007-08 season saw him receive a call up for the 2008 Six Nations squad. Payne for England in June 2009 and later earned a call up to the British & Irish Lions camp for their tour of South Africa. He took more caps for England in 2010 but it appears that his international days are at an end. Since then, Payne has been a consistent performer for Wasps and marked the start of the 2012-13 season with a try against Harlequins.